The first ever Pearson Seminar on Collaborative Leadership (PSCL), a program for adults, developed by Kelsey Cham, Rebekah Parker and Kathryn Mc Cabe after the hugely successful youth program PSYL, is coming to an end and we went and met with the team to hear what they had to say about this brand-new program. 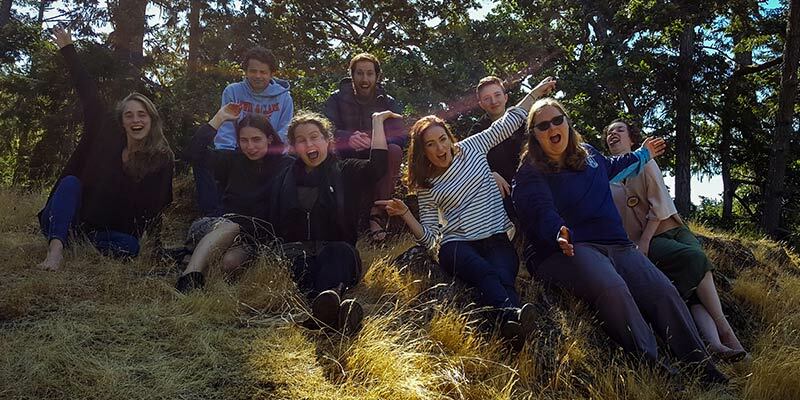 It was a small group of seven, who came together on the shores of Pedder Bay to connect with themselves, the group, the land and global topics for 12 days. During that time, we would find them scattered across campus, by themselves or deep in discussion as a group, in the forest, or out on the water. Headquarter was at the “fridge” (a beloved PSYL term for the Students Common Room, because you can chill there) or the grassy knoll in front of the pool building. The PSCL facilitators provided the participants just enough structure to feel safe and supported, but also left the necessary room to meet each participant’s needs. According to the participants themselves, it was internal work, group work and emergence at its best.